Although both Reed and Green are in the pantheon of post-60s abstraction, there is a real freshness to the work and true relevance to artists continuing the journey of abstract painting. The paintings on canvas and paper have a loose and confident approach. 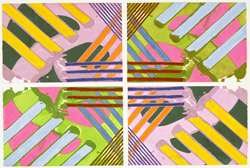 Paul Reed, 31492 (A,B,C,D Quadtych), 1992, Gouache on paper, 30" x 44 "
David Richard Gallery presents rarely-seen work by two important painters who were part of the influential Washington DC art scene that emerged in the 1960s. Paul Reed was one of the founders of the Washington Color School, along with artists like Morris Louis and Kenneth Noland, whose work had a major impact on abstract painting after the 50s. Experimental shapes and color combinations are the hallmarks of Reed’s work. Tom Green, a fellow Washingtonian, was greatly influenced by the older Reed and this is evident in his approach to color. Yet there is a playfulness in his work reminiscent of Joan Miro’s Constellation series. David Richard Gallery is delighted to present “A Fresh Look”, two solo exhibitions featuring later-career work by Paul Reed and Tom Green. The exhibition for Reed presents works on paper from the late 1980s through the early 90’s — diptychs, triptychs and quadriptychs — where Reed explored visual perception using mirror images of lyrical shapes and color harmonies. Green’s exhibition is a selection of paintings on canvas and paper that were created between 2006 through 2010 and represent his last major body of work prior to his death. The presentations will be on exhibition from March 11 – April 23, 2016 with an opening reception on Friday, March 11 from 5:00 to 8:00 PM. The gallery’s new location is at 1570 Pacheco Street, Suite A1, Santa Fe, New Mexico 87505, phone 505-983-9555 in the midtown neighborhood art and design district. Tom Green, who taught at the Corcoran College of Art and Design for 40 years, was influenced by the Washington Color School, which emphasized abstract, geometric paintings in bright colors. Born in 1942, Green received his BFA and MFA from the University of Maryland. His first solo exhibition was in 1968, which began an illustrious exhibition career that lasted until his death in 2012. His work can be found in the Guggenheim Museum, Smithsonian Museum of American Art, Corcoran Gallery of Art, Baltimore Museum of Art, among numerous other public collections. Paul Reed, born in Washington DC in 1919, was one of the founding members – along with Gene Davis, Morris Louis, Kenneth Noland, Howard Mehring and Tom Downing - of the Washington Color School and a major proponent of Color Field Painting. The focus of his long career was based on color and the interplay with surface and light. Reed created luminous paintings— stretched, not stretched, square, rectangular and dynamically shaped, on canvas, muslin and paper—that explored transparency through a range of subject matter spanning mandalas, biomorphic shapes, discs and geometric abstractions. Reed graduated from San Diego State College and the Corcoran School of Art where he taught from 1962 to 1971. The Washington Color School burst on the scene with an exhibition in 1965 at the Washington Gallery of Modern Art. He was featured the following year in the Des Moines Art Center exhibition Op Art. Public collections include the Detroit Institute of Art, Hirshhorn Museum and Sculpture Garden, National Museum of Art , Phoenix Museum of Art, Boca Raton Museum of Art, Santa Barbara Museum of Art and the Wadsworth Athenaeum. Paul Reed continued an active exhibition career until his passing in 2015. David Richard Gallery is located at 1570 Pacheco Street, Suite A1, Santa Fe, NM 87505, P: 505-983-9555. Since its inception the gallery has produced museum quality exhibitions that feature Post War abstraction in the US. The presentations have addressed specific decades and geographies as well as certain movements and tendencies. While the gallery has long been recognized as an important proponent of post-1960s abstraction—including both the influential pioneers as well as a younger generation of practitioners in this field—in keeping with this spirit of nurture and development the gallery presents established and very new artists who embrace more gestural and representational approaches to the making of art as well as young emerging artists.